Dave Jackson, left, managing director of 328 Support Services, and Colin Mahoney, senior v-p, international and service solutions for Rockwell Collins. Turkey’s TRJet, developer of TRJ328 twinjet and TRP328 twin turboprop introduced at last year’s Paris Airshow, announced here suppliers of key systems for the multipurpose aircraft, including avionics for the jet, and the engine for the turboprop, and also reported new orders for the aircraft. The 328s are updated versions of the Dornier 328, the only aircraft certified for both jet and turboprop variants. TRJet is an affiliate of U.S.-based Sierra Nevada Corporation (SNC, Chalet C12), which owns the rights to the original Dornier design. 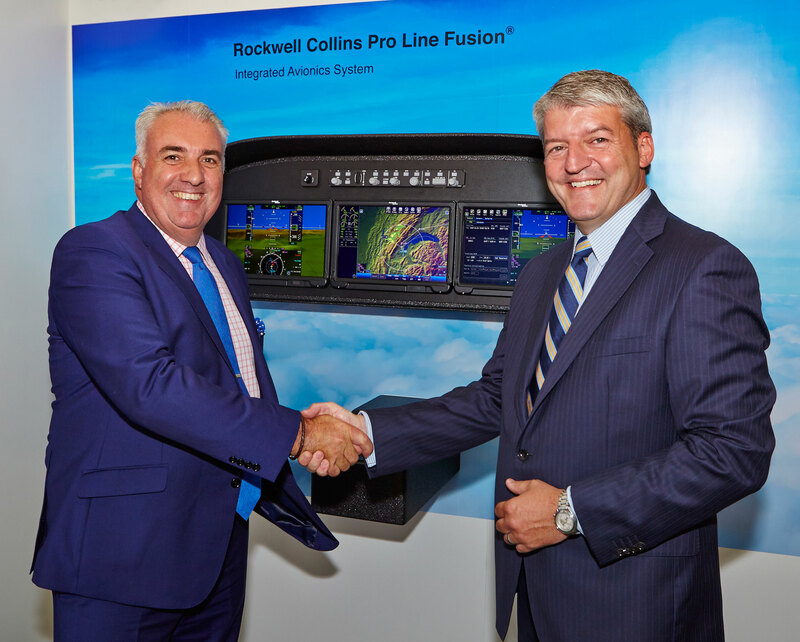 TRJet has chosen Rockwell Collins’ Pro Line Fusion for the jet’s avionics suite, and Pratt & Whitney Canada’s (P&WC’s) PW127 as the turboprop’s engine. Heggemann AG will supply the main landing gear and nose landing gear for both variants, while Liebherr Aerospace will supply their air management systems. In 30-seat commercial carrier configurations, the jet and turboprop will have ranges of 1,120 nautical miles and 900 nm respectively, but the 328s are also expected to be in demand for special mission roles, as well as for corporate and VIP transport. Colin Mahoney, Rockwell Collins senior vice president, international and service solutions, said the TRJet 328 Series flight deck “will feature a dramatic leap in capabilities, enabling pilots to successfully complete missions, whether that’s flying commercial passengers or special operations.” Meanwhile, the new engine program for the TRP328 will commence late this year at P&WC’s Longueuil, Quebec facility. Here at the show, the company signed a Letter of Intent (LoI) with the Istanbul Chamber of Commerce for 10 TRJ328s, and with Sentinel Aerospace Group of Singapore for five TRP328s for special mission use. Under a memorandum of understanding signed last year, the Turkish Ministry of Transport, Maritime Affairs & Communications will order up to 50 of the aircraft as part of a plan to produce a Turkish-built regional jet and boost the country’s indigenous aviation industry. Its initial order of six TRJ328s will go to customers including the Turkish Ministry of Health and the Turkish Airports Authority, serving in roles ranging from air ambulance, special mission, VIP, airport calibration to passenger transport. First delivery of the TRJ328 is anticipated in the 2019/20 timeframe, as is the first flight of the TRP328. In addition to international partners, Turkish vendors will also play a large role in the program, said Dave Jackson, manager director of SNC subsidiary and program participant 328 Support Services. The development program is part of the Turkish Regional Aircraft Project, which includes plans for a larger, clean sheet design to begin development concurrently with production of the 328 Series, expected to fly in time for Turkey's centennial celebration in 2023.